A farmer from Ynys Môn has been sentenced to pay £220 for refusing to pay his TV licence as part of a campaign for Welsh broadcasting powers at a court hearing in Caernarfon today (Monday, 5th November). 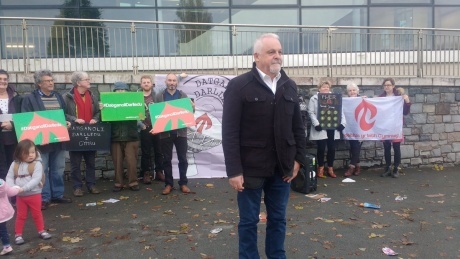 The 56 year-old farmer from Bodorgan on Ynys Môn, William Griffiths, is the second person to receive a court sanction for refusing to pay his TV licence as part of the effort to devolving broadcasting to the Senedd in Cardiff. Another member of Cymdeithas yr Iaith, Heledd Gwyndaf, was sentenced in Aberystwyth last month. There are over seventy people currently refusing to pay their TV licence fees as part of a campaign to devolve control over broadcasting from Westminster to Wales. According to a YouGov opinion poll published last year, 65% of people in Wales favour devolving powers over broadcasting to the Senedd in Cardiff. "Control over broadcasting is something that is a basic right for any country. It's important in terms of how we see the world and how the world sees us. It's also vital to protect Welsh language broadcasting. "Devolving broadcasting is also important in terms of democracy in Wales. At the last general election for example, the London-based news swamped us with Theresa May talking about health and Corbn talking about education. That's all irrelevant to us in Wales. The same with the Brexit referendum. The wasn't a Wales-focussed discussion. Whatever your opinion about Brexit and whatever political party you support, promoting democracy is essential. "We must ask the question: what type of country would want control of broadcasting in another country? This campaign is vital for a better future for the people of Wales." "Many thanks to William for his bravery. I, like growing numbers of other people, are also refusing to pay for my TV licence until decisions about broadcasting in Wales are made by the people of Wales. The Welsh language and Welsh democracy are seriously suffering as a result of the Westminster-run broadcasting system at the moment. Controlling our own media in Wales will give us a chance to see the world through Welsh eyes." Last year, campaign group Cymdeithas yr Iaith presented their proposals for a devolved system of broadcasting. They claim that tens of millions of pounds extra would be available to invest in Welsh content on TV, radio and online through devolution with control over the licence fee and a new tax on big new media businesses like Netflix, YouTube and Facebook.